Points off for the irregularity of my posting lately. I have lots of projects in the air, but nothing with sufficient clarity to write about. So this is another what-I've-been-doing-this-week post. It's like when you get behind in your correspondence: the behinder you get, the harder it is to write anything at all. I've been working on setting up a practice log on Ning, the site that hosts CelloBloggers. Here is a link to my first page: Bach 2-part Invention in C. I may start thinking out loud here about how I want to keep a practice log - at least that will keep the posts coming! I finally picked up my cello after a 2+week hiatus. At last I feel like playing again, but of course my chops are totally mushy. I'm starting off very slowly - 10 minutes the first day, 20 minutes the next - and so far playing 2 octave scales in a variety of bowings and reading through the etudes in the first volume of Schroeder. And not working on anything. I expect my desire to play my cello will increase dramatically on Thursday, when a new cello arrives. Note I say a new cello, not the new cello. Who knows when that cello will ever leave England. No, this is a cello I have loved but not owned for over a year. 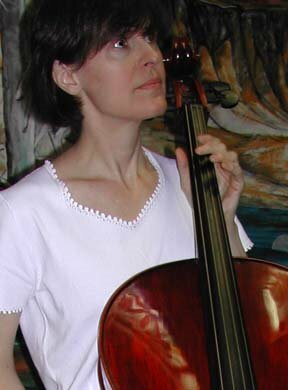 It's actually the cello in my profile photo here, but I won't tell you more until after it arrives. I don't want to jinx it. On the kitty front, I've heard from QT's new home, his new owner is in love with him, and in photo's and videos she has sent he looks very happy. I took the other Cousins to Petco again this weekend, along with two of D-s kittens, as she is out of town. No more. A lot of work for little return and too much trouble. I was so disgusted I'm about ready to adopt these four myself and stop fostering. Thinking of pets as living beings we assume responsibility for, I guess I just have fundamental differences with those who view them as property without feelings. Knee rehab is going slowly but surely. My gait is normal most of the time, though I still have to think about it. And I'm really tired of not being able to bend my knee fully. It's the little things, like getting out of a car, where I notice it. Still not back to running. I've taken one 2 mile walk, which was more difficult than I expected. I can't remember the last time I got out of breath just walking. Gotta pick up the pace so I can be ready for our Scotland trip next month. That about does it. I'll start fresh tomorrow. Yeah I'd ditch Petco if I were you. Adopting a cat isn't a Saturday afternoon impulse, which is the category of 'shoppers' they seem to target.